REA's Essentials provide quick and easy access to critical information in a variety of different fields, ranging from the most basic to the most advanced. As its name implies, these concise, comprehensive study guides summarize the essentials of the field covered. Essentials are helpful when preparing for exams, doing homework and will remain a lasting reference source for students, teachers, and professionals. 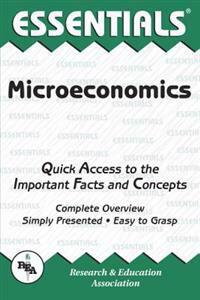 Microeconomics includes the fundamentals of supply and demand, consumer theory, production, perfect competition, the monopoly, and factor prices.